This world we live in is changing so fast with technology advancing and becoming ever more present at leaps and bounds. Identity theft is a real problem and one way personal data is being stolen is using RFID (Radio-frequency identification) to grab people’s information though electromagnetic fields out of their wallets without ever even touching the wallet. That is why RFID blocking wallets are becoming a no-brainer. Why not protect yourself? KORE ESSENTIALS has just introduced two new RFID Blocking Wallets and they provided me with one RFID protection wallet in order to facilitate review. All opinions expressed are my own. KORE ESSENTIALS focuses on “redesigning the essentials, making simpler, smarter, more stylish accessories for men.” In fact, they totally redesigned men’s belts with stylish, functional design. Since my husband loves their Trackline belts, I thought he may also love the KORE RFID blocking wallets. The wallets are designed with two key things in mind, a slimmer wallet (for a better look and feel) and RFID protection (to keep credit card numbers safe). There are two RFID Blocking Wallets By KORE ESSENTIALS and both options are handcrafted, full-grain leather, lined with secure RFID blocking material to keep your credit and ID cards safe from unwanted scanning and theft. 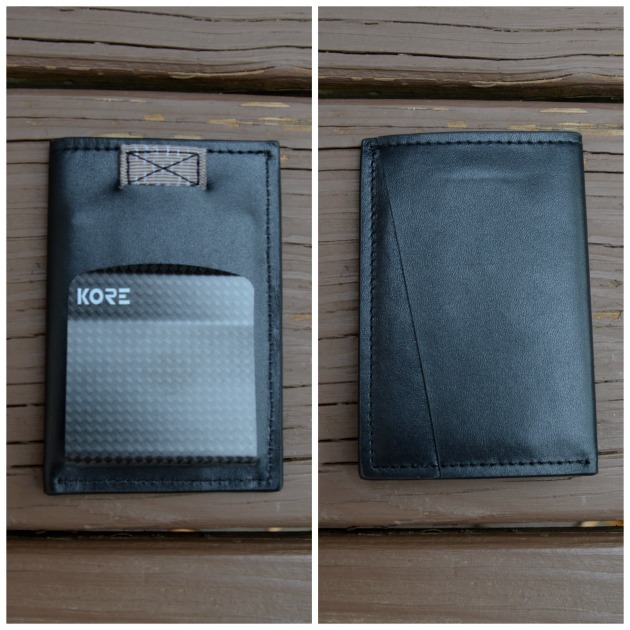 The first RFID blocking wallet men are sure to love is the KORE BI-FOLD WALLET [RFID PROTECTED]. It is a little more traditional. 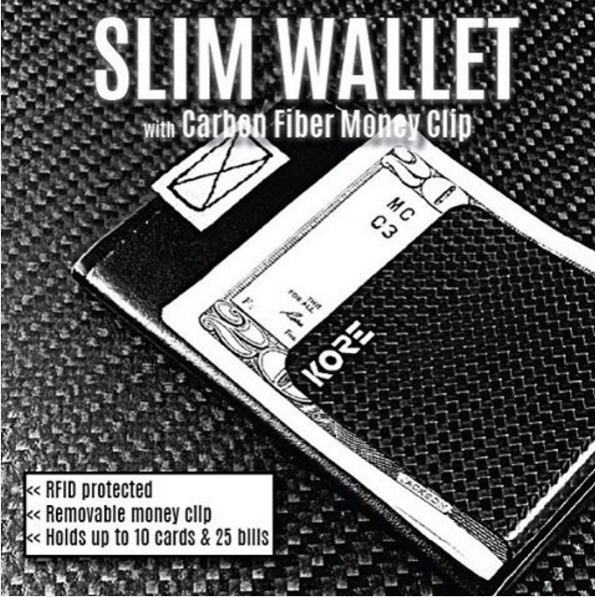 The second option is the KORE SLIM WALLET + CARBON FIBER MONEY CLIP [RFID PROTECTED]. 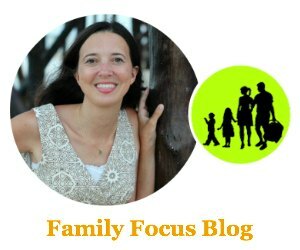 I chose this option for my husband because I thought he might enjoy trying something new. He’s never had a money clip before and I figured the slim design would force him to stop carrying so much junk in his wallet. 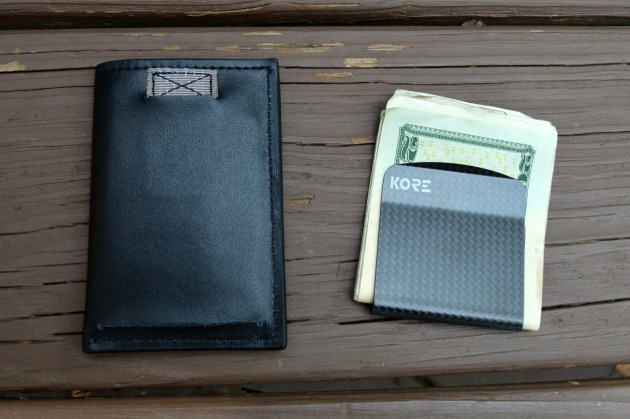 The new KORE Slim Wallet with integrated carbon fiber money clip is sleek and secure. It looks classy and does not take up too much room. For my husband, this was a great opportunity to clean his wallet out and stop storing things he didn’t need. The front pocket is handy for carrying a few business cards or other cards without magnetic strips and the main compartment (RFID protected) can carry up to 8 cards. We fit his ATM card, Driver’s License, Insurance Card, and 3 credit cards easily. His cash fits easily in the money clip (up to 20 bills) and if he doesn’t need much cash that day, he can always leave his money clip at home for an even slimmer wallet. – RFID Protected main compartment keeps up to 8 credit cards safe from unwanted scanning and identity theft by blocking radio frequency waves. – Handcrafted using full-grain leather (the best grade of cowhide) for durability, comfort and style. – Smart Tab allows you to instantly access up to 8 credit cards from the main compartment without having to dig. When you push the cards back in, the pull tab also returns to it’s original position. Visit koreessentials.com to learn more or buy one of these RFID blocking wallets. The KORE Slim Wallet looks so much nicer in my husbands pockets than his old bulky wallet and we love the RFID blocking function. Did you know what RFID protection was before? Do you want to try one of these slim leather RFID blocking wallets for yourself or someone you know? They make a great gift!